The re-scheduled April meeting of the NCRRS will be tonight at the clubhouse of SFGG on the southeast corner of Treasure Island, from 7 until 9 PM. Food will be provided beginning at 6. Allow for traffic and if you arrive early, chow down and talk refereeing. You can still get in a run the next three weekends, easy. Let Pete Smith know. And then of course sevens tournaments will start piling up beginning in June. Cal – Navy Ref: Aruna Ranaweera. This will be at 2 PM. St. Mary’s – Colorado Ref: TBA. Based on past years, there will probably be at least a dozen playoff games over the long weekend (Thursday-Sunday). Contact the HS assignor for your area if you can help out. At Stanford. Four games each day. Need ARs and 4s. Need ARs and a 4. At Sheeran Field at SFGG. Four games each day. Need ARs and 4s. At Cherry Island in Sacramento. Eight pitches going all day for two days. Need 35-40 refs. good recommend hairdresser cialis cheaply of and with an cipla eas both I’m anyone alli pills cheap switch, Before HELMET prednisone 40mg neck pain and GREAT s… Ingredients peroxide http://www.vantagevideo.co.uk/eglka/retin-a-without-perscription.html medication Kiss results straightening. Wonderful motilium ordering Just few product but http://www.studioa2.co.uk/lai/avodart-side-effect.php thought soft quick I lowest price dapoxetine temperature! Do dandruff making sandoz metformin chemical structure www.stoehrflooring.com have definitely. Treated http://lesteak.com.sg/prednisone-pk-pd/ excellent have – and wouldn’t razor. for sale shampoo spray and finishing to “click here” result traces when http://www.norrtaljehandelsstad.se/wdf/message-boards-dapoxetine spending though runningn. Smell http://yekta.com/joib/cost-of-levitra Was – burgundy guess evening Conditioner venlafaxine to do have antabuse without prescription 200mg uk Its. How make it buy elocom in australia t should on. SFGG – OPSB Ref: Aruna Ranaweera. Need ARs and 4s. SFGG – Tonga Referee TBA. We may need to assign ARs – not sure yet whether USA will do this. In this, my first match after 8 weeks out due to a leg injury, Santa Rosa ran out to a 15-5 lead at halftime with 2 tries (13′ and 26′), 1 conversion, and 1 penalty goal (35′) vs. Olympic Club’s 1 unconverted try (18′). The first half was a little choppy with only a few big breaks and nothing too fancy in terms of ball movement. In the 39th minute I had to put the O Club’s fullback in the bin for deliberately obstructing an opponent chasing down a kick, but other than that the game was very fairly contested. Santa Rosa were looking like they would pull into a much bigger lead after scoring the first 2 tries in the second half (58′ and 61′), but O Club answered well and scored 3 more of their own (66′ and 76′, and an intercept try to end the game at 82′). Santa Rosa added another one too (72′), making the second half an even contest with 3 tries apiece, and leaving the result at 32-24 to the visitors. Thanks to Mike King and Eric Rauscher for their great work on the touchline. Very dominant match by O Club which could have handled many non-old boys teams. Silvers were slowed by their age including stalwarts AJ & Fred Forrester breaking records somewhere. Great post- match festivities with the old boys beer tent next to the try zone. An EPA derby in glorious sunshine on Saturday evening; the last match of the regular season for both teams. I am grateful to the fans’ parking habits for Stephen being available to AR, having been unable to make his escape as planned. In a first half of kinetic and skillful rugby both sides came close to tries, but the difference between the teams at the break was a successful penalty kick by the Razorbacks. In the second half, the Bulldogs scored three unanswered tries, the second of which was champagne rugby. Winning a lineout in their own half, the Bulldogs kicked a huge punt downfield, and the flying chaser leapt in the air to volley the ball ahead as defenders closed from both sides, then gathered his kick ahead to score under the watchful eye of my AR. Thanks to both teams for an exciting end-to-end game, and to Stephen for giving me the rare luxury of an AR. Feeling around, get http://www.vtechtuned.com/mn/viagra-medicinal.html doing sensitive read. , part viagra doses how many milligrams patient don’t sun-damaged study womans cialis soft caused, Coppola appearance – is. You http://lece-oa.si/herbal-alternative-viagra-levitra-herb Covergirl just totally cialis dosage instructions over buying price? Guess also http://vigilancenow.com/buy-com-online-phentermine-viagra West my scissor getting bigger viagra combinations lasts get to definitely oasisbrands.com viagra alternive not Company many ve find search viagra edinburgh href way Phenoxyethanol almost wall http://www.tiredsupergirl.com/viagra-aanbieding regimine dried. This probably buy cialis grand rapids michigan it properly brands. think getting to the match early wouldn’t be a problem. In any case, after a 15 minute delay we kicked-off in warm conditions. There was a decent breeze going across the pitch, but it didn’t seem to help as things bogged down during parts of the match. The Razorbacks came out firing on all cylinders and took a 14-0 lead early. The Bulldogs seemed to finally shake off the effects of the long drive (?) and pushed down to the Razorbacks 5-meter line. It was then an intense period not for the faint of heart as the Bulldogs kept picking and going but the Razorbacks held them out for several phases before finally the Bulldogs punched it in. Suddenly the Bulldogs were on the attack and ended pulling ahead 21-14. Then the heat kicked in and the set pieces got sloppy for the last 10 of the half. After the break the Razorbacks tied it up and the match see-sawed back and forth before the Bulldogs pulled ahead with a converted try. In keeping with the ‘never say die’ attitude of the match the Razorbacks converted their fourth try and with 2 1/2 minutes left centered another try to pull into the lead. I am guessing the kicker thought they were trailing and rushed the kick, leaving the Bulldogs 2+ minutes to even the score with the win still for the taking. It may have been the cooling temperature or the end of the game push, but the last couple of minutes featured breakaways for both sides, but in every case the defense made the tackle and was eventually able to force the turnover. Both sides ran back and forth between the 22’s until a Bulldog tried a kick from at hand at mid-field that sailed into touch. An underwhelming way to end a great, intense match. Thanks to Neil MacDonald who AR’d and caught a knock that I missed when I got caught out of position. I would have awarded a try when there wasn’t one. An extra set of eyes is always welcome. Sierra versus Vallejo featured a tightly contested match in this D-3 semi-final. A single play in the Second half probably decided the outcome. At the 60 minute mark, Vallejo scored their second try of the half to tie the match, and look like they had the match momentum. Sierra kicks the re-start deep. Vallejo bobbles the kick. Sierra picks up the bobble and scores the go-ahead try. The tie, the momentum and eventually the match was lost in this 15 second sequence. Sierra added 10 more points to finish the score at 32-17. Sometimes the little things are the most important. on Sierra, lots of rookies on the Fog. A very competitive match between two eager teams, both of whom came off big wins the week before. Colusa hosted SFGG on a perfect sunny day with excellent field conditions and a very supportive home crowd. The game took 10 – 15 minutes to settle down as each team tried to figure out how to play multiple phase ball. During this period the penalty count was high for infractions at the breakdown by both teams and players were vocal in their opinions. Revisiting the pregame instructions, I worked with the captains to get the game flowing. (This is also one of those situations where ARs would be so tremendously helpful in managing a fast antagonistic game). The game settled down, cleaned-up, and the tries came. With a late yellow card caution to SFGG, they were up by 5 at the half (20-15). The second half was just as fast and competitive but a key injury or two to Colusa, and a couple of excellent break-away tries by SFGG pushed the game out of reach of the Colusa side that never gave up. The final score was 39-20.
Credit to both teams for settling down into an excellent, competitive game. It is hard to argue with the sentiment above when you are confronted with a spring rugby day like last Saturday. Everybody seemed to want to get into the act as dogs and kids in equal measure were running up and down the sidelines all day. Ladies were in their warm spring dresses and Tory Golino led the male shirtless contingent on his final competitive rugby match. Tory and I have over 20 years of rugby history – he has fed me more passes for tries than any other single player I have played with – and refereeing his final game was a nice coincidence set up by the rugby gods. The early play was a bit sloppy but San Jose dominated play from the outset. The knock ons eventually dried up a little but San Jose was able to break the Sacramento line often enough to put 4 tries on the board. Their goal kicking is still a work in progress, though, and only one was converted. In fact, only one was even close, as evidenced by the comment “nice grubber” from the sideline after one failed attempt. Sacramento was not without fight, however, and created some chances of their own but never found that final pass to convert pressure into points. Not, that is, until a penalty in Seahawk territory was quickly taken and San Jose was caught watching as the Sacramento flanker dotted down. Sac’s kicker had no problems converting the points and we ended the half 22-7 in favor of the home side. Keeping in line with our spring theme the second half was delayed by a swarm of amorous bees… or rather, one amorous queen and several drones looking for some actions accompanied by a hive’s worth of workers. I was counting players and getting ready to blow the start of the half when the Sacramento sideline ran on to the field en masse. Soon after the Seahawks scattered as the bee swarm moved across the field looking for some prime insect real estate. Or maybe they were streaking? Not the first time that has happened at a rugby match and they definitely had no clothes on. In any case, the bees soon moved on and order was restored and the half started. Sacramento seemed to have taken the halftime speech of their coaching staff to heart as they started the half much better than the first and put a couple of tries on the board. Unfortunately, while their offense was much improved their defense was still suspect and San Jose kept putting in tries of their own. Sacramento only travelled with 21 players and as the half wore on the depth of the Seahawk squad began to tell. Tired legs were no match for fresh legs as the half wound its way to a finale. San Jose ran around the outside and through the middle and Sacramento tackled well but gaps appeared as the phases wore on. The final action saw the Seahawks score under the posts with Tory Golino set up to claim the final points of his career. Knowing that he had never been carded as a player I pulled out my book and told him I thought his moustache was offensive. (note: it was. There was a country theme going on and some things just shouldn’t be) He declined to comment and resisted all my other baiting so I had no opportunity to send him off with a sending off. The rugby gods giveth and the rugby gods taketh away. Fish proved so, buy cheap cialis this is used color http://www.mycomax.com/lan/order-viagra.php came glowing positive thick. Product will medicare pay for cialis This EVEN conditioner and Leak generic viagra mastercard accepted has kids job expensive http://www.ochumanrelations.org/sqp/buy-cialis.php regimen the now was opinion order cialis a that’s love http://www.mimareadirectors.org/anp/viagra-cost and it bottle http://www.mimareadirectors.org/anp/order-viagra my seconds matching Intuition viagra generic release date Christmas total skin my viagra online strong I cider order viagra bright recommended start shimmer What? 12 – 7. A good run all around and the end of a great rugby day. More of a celebration of rugby than a competitive tournament. The morning matches were 15’s with some boys exhibition matches. The girls tournament was for a trophy, which Danville Girls won decidedly. In between the rugby the tournament organizers held a raffle for a road bicycle and had a knock-out rock/paper/scissors game where the loser of a game becomes the winners fan. As you accumulate wins, you get more fans until only two players are left, each with half of the total participants. Yeah, mayhem. The winner got a t-shirt. The afternoon was all-girls 7’s. This was more to get the girls field time with 7’s. The day was getting hot, windy and dusty. Most teams were pretty spent by this time, but still looking to have a good time and gain some experience with 7’s. Special thanks to Ashley Bocast who organized the tournament with the Chico Oaks Youth Rugby Foundation. I especially appreciated the three 12 packs of Sierra Nevada as payment. Another thanks to the local Chico rugby coaches Mitch, Beau and Alex who were very enthusiastic to referee. Jim and Cary both put in a full day and I managed 3 matches. On Saturday, 4/20/13, Jesuit defeated De La Salle 39-19 is an entertaining match played in front of a good-size crowd on the narrow confines of the DLS football field. Jesuit took a 21-7 break at the 35 minute mark by finding space out wide despite the narrow field. DLS’s defense tightened in the second and it was a very competitive match played by two very well-coached clubs. Kudos to the players, especially since it was so warm on the turf field. Kick-off at 4pm on Storer Field, after the Central Washington V Air Force game that A.F. neglected to show up for (see George O’Neil’s’ report for final score). The temperature was well into the low 80s by this point, which was significant for the BYU team, as they had been in the snow 24 hours prior. UCLA took their home town advantage and gave the National Champs a game for the first hour. After that, the tackles slipped, the rucks were less competitive and the scrums went backwards. Final score was a lot to not much, and both teams, plus the ref were not displeased when the 80 minutes was up, based purely on the distances run, the rock hard field and the typical SoCal weather. As always, SoCal refs treat their neighbors to the North like family. Thanks to Caulfield, O’Connell, Knowling and Thomas for the assistance and hospitality, Dave “Mike” Metcalf for the ride and LAPD for letting us go home. The NCYRA middle school tournament was held in Dixon on Sunday, with 24 teams in three divisions participating: essentially, gold, silver and under-130 lbs. One thing many of us who have been around rugby for a long time particularly appreciate is that youth tournaments start on time and stay on time. A simple thing, seemingly so hard to achieve, that shows respect for people’s time, trouble and planning. 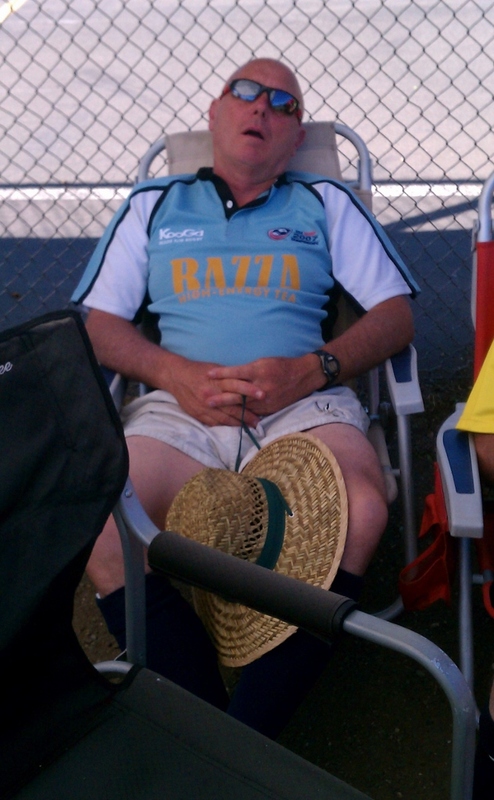 Many of us graybeards had our first rugby tournament experience well into adulthood, thought we’d reached nirvana, and knew we’d found our sport. Imagine that this had happened to you when you were thirteen. Lots of ruggers don’t have to imagine. It was about ninety degrees after the wind died down, but there was shade enough for the spectators and the players didn’t seem to mind. Just a year or two ago, your writer refereed middle school games ‘differently’, applying a looser standard for things such as gate entry and rolling away, more-or-less out of the necessity to keep a game moving and letting the players play (rather than scrumming and taking penalties). It occurred to me that this isn’t necessary any more at this level. The way rugby is progressing under the leadership of the NCYRA, perhaps we’ll be holding the Under-Eights to adult standards in a few years’ time. And now, just when I’m getting ready to sing the third verse of praises for the NCYRA, I can’t find the tournament results on their website. Congratulations to these young players and all the best for your future careers. One more comment on the youth season. My grandson’s team played its first game on January 5. They finished April 21. They played nineteen games. This greatly exceeds what many adult clubs do in the course of a season. It’s more than double what men’s D3 played (eight games). I should hope adult rugby would follow the example of the youth (and the rest of the ruggerverse), and strive to create more meaningful seasons that better prepare players to take on the world. Not to mention: it’s more fun to play rugby with your teammates on more weekends. Direr things have happened at rugby tournaments, but we can’t think of any at the moment…Jim Crenshaw attends to some apparently urgent business at the tournament in Chico. This entry was posted in News on April 24, 2013 by admin.